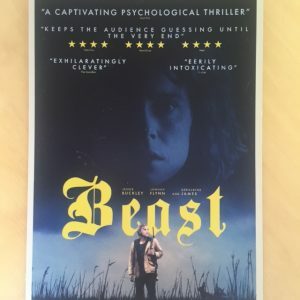 I hadn’t seen any clips or trailers for this British movie but the snippets I had read in the press were really intriguing. It’s set on the isle of Jersey; a warm sunny day – our lead character is Moll (Jessie Buckley) she and her family are having a barbeque to celebrate her birthday… everyone is gathered in the garden of the family home. Moll’s sister gives a little speech to wish Moll a happy birthday; however, it turns out the speech is an excuse to share her own news that she & her partner are expecting twins.. All of the attention is now completely focused on Moll’s sister as her Mum asks Moll to go ‘fetch the champagne’… Understandably Moll is out-raged & drops a glass in the kitchen which she crushes in her bare hand (through anger) you are made completely aware at this moment there is something more than just sibling rivalry going on; what is Moll’s dark secret? Moll leaves her own birthday celebrations and heads into town searching for fun – dancing, drinking, trying to forget.. The night scenes soon flow into early morning, Moll walking along a deserted beach – a young guy from the night before is there with her, pestering her… Out of the blue something hits the guy on his face; they both look in the direction of where the flying object came from – standing in front of them is a weather scorched, young blonde man with messy hair, carrying a rifle! Moll’s pest soon makes a sharp exit. Our mysterious and extremely intriguing stranger is Pascal Renouf – perfectly played by the engaging Johnny Flynn who tells Moll when asked what he does ; ‘I work with my hands’…. The camera loves zooming in showing close-up shots of Pascal’s dirty finger-nails and his intense eyes looking at Moll..
Moll’s life/world is pretty stifled by her family especially her domineering mother – (Geraldine James) who never seems to let Moll forget her past mistake (the dark secret)…. Her mother also conducts the local church choir which Moll sings in..
Whilst this is all going on we are also shown per TV news footage that horrific murders are taking place on the isle – the murders are of young woman. After further arguments with her family Moll finally has the courage to leave the family home and move in with Pascal…. It is clear they both adore each other and seem to understand one another more than anyone has ever done before. The police investigation of the horrendous local murders becomes more focussed and Pascal who has had previous run-in’s with the police is named as a suspect!! How will Moll react to the news? Is Pascal innocent? 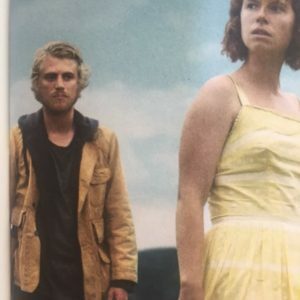 Fantastic lead actors – Jessie Buckley and Johnny Flynn are so watchable!